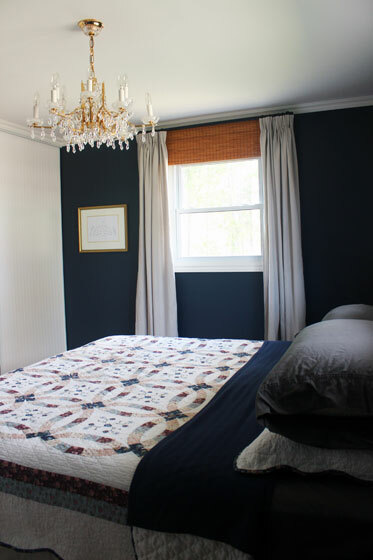 In the last post, you saw the easy layered window treatments in the master bedroom. I promised more details on the dropcloth curtains I made. 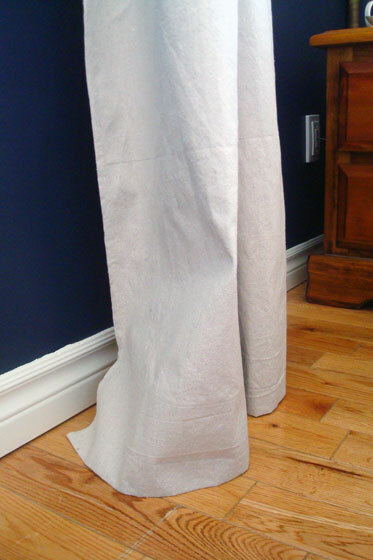 There are lots of tutorials out there on how to make dropcloth curtains. So I’m not going to write one here. Plus, I totally made these up as I went along, so a tutorial doesn’t really exist. 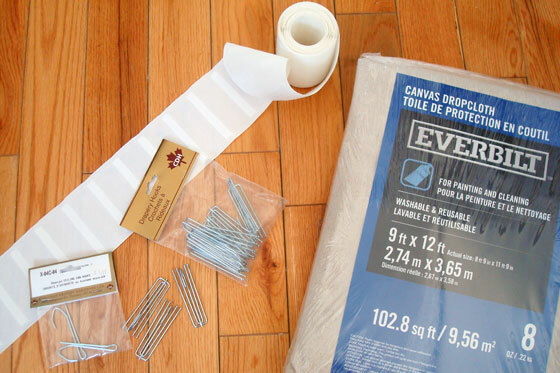 I did want to share some of the things I learned from making my DIY curtains, though. 1. Dropcloths come with seams. I assumed that my 9 by 12 foot dropcloth would be one single piece of fabric. It wasn’t. All of my dropcloths had a seam down the middle. 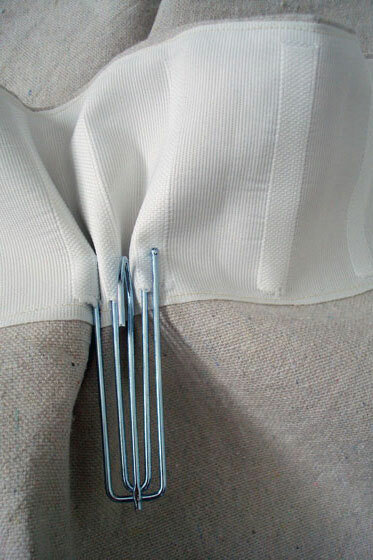 One had a centre seam plus an additional patch along one end. For my two widest curtain panels, I just left the seam alone. It’s a bit thicker than I would like and a wee bit puckered, but I decided I could live with it if it was hidden in the folds of the curtains. For the other curtains, my seam ripper and I spent some quality time pulling out the stitching. 2. Dropcloths come with holes. The canvas fabric of the dropcloths is not perfect. The rustic quality of the weave and the few strands of blue and red that were here and there are some of the elements I like best about using this fabric. However, in a couple of spots my dropcloths went beyond rustic and veered into unraveled. So if you want to make anything out of dropcloths, check them over carefully. You don’t want to end up with a hole in the middle of your project. 3. Wash and iron before you start. Pre-washing your fabric is a basic tenant of sewing. I didn’t want my curtains shrinking (not that they’re going to be washed often) after I put the effort into making them, so I washed my fabric before I started sewing. Dropcloth fabric is heavy duty. As a result, it wrinkles easily and the creases are really difficult to remove. I found that ironing the dropcloths when they were still damp from the washer helped to remove the worst of the wrinkles. 4. Use curtain tape. (Britt, this tip’s for you). From what I hear, making pinch pleat curtains is pretty tedious. Lots of measuring and calculating. A much easier solution is to use curtain tape. This is a kind of mesh fabric strip with channels on the back. You pair it with some special multi-pronged hooks, and it basically forms the pleats for you. I bought mine at a local fabric store. The pleats are softer than they would be if you sewed them without the tape, but that was okay for my rustic fabric and my farm setting. I sewed the tape along the edge of one of my dropcloths, put in the hooks and voilà, pinch pleat curtains. You can space your pleats as far apart or as close together as you want. I left one empty “pocket” for a space of about 6 inches between each pleat. 5. 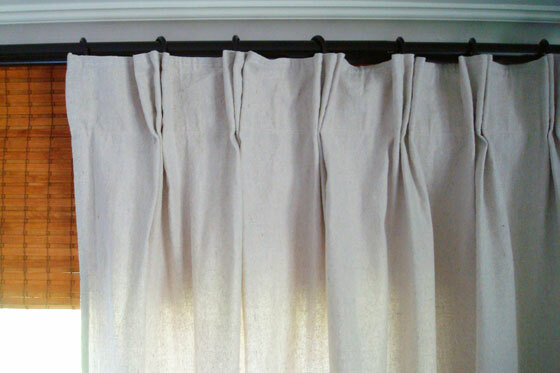 Use curtain tape to measure your curtains. Before I sewed the curtain tape onto my fabric, I formed all of my pleats until I had a strip that was as wide as I wanted my curtains to be. Then I cut the curtain tape at that length, removed the pleats and used the tape to measure the dropcloth fabric. 6. There are different types of hooks. The magic pleat-making hooks are very handy. They come in two different forms (there may be more, but I tried two). Whatever form you choose, the hooks hook onto the rings that go on your curtain rod. Option 1 has the hooks at the end, so the curtains hang a bit below the rings. Option 2 has the hooks in the middle, so the top of the curtain hangs up against the rings. This is the type of hook I ended up using. There are also special non-pleating hooks (just plain single hooks) to hold up the ends of the curtains where there are no pleats. 7. Take your time hemming. I wanted my curtains to just brush the floor. For my first set, I hung the curtains, found the spot where they met the floor, and then I used a ruler to measure the rest of my hem from that point. The result was curtains that were the right length at one or two spots, but for the most part they scuffed, not brushed the floor. For my second set of panels and for the bed skirt that I also made out of dropcloths, I skipped the measuring tape. Instead, I used pins to mark the fabric at about 1/4 to 1/2 inch off the floor. I pinned my way across the bottom of the curtains, marking about every six inches. 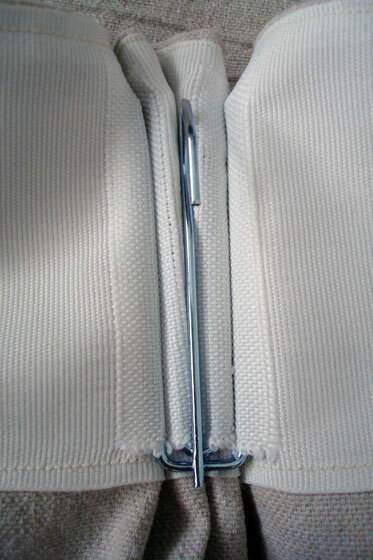 Then I pressed the hem using the pins as a guide. It wasn’t scientific, but it resulted in curtains that just brushed the floor. 8. You can totally do this too. Dropcloth curtains are pretty easy to make. Honestly, I found them a bit tedious. The only sewing is in straight lines. Loooooong straight lines. 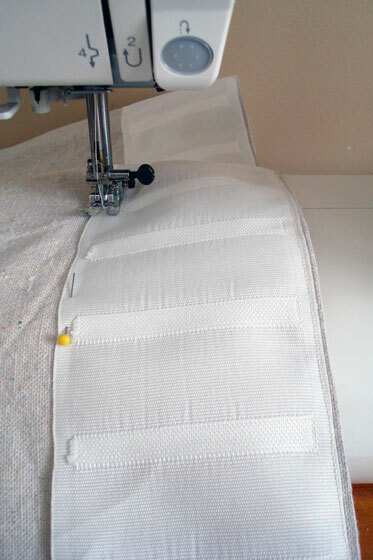 However, boring they may be, sewing straight lines is not difficult. Let me know if you try them yourself. 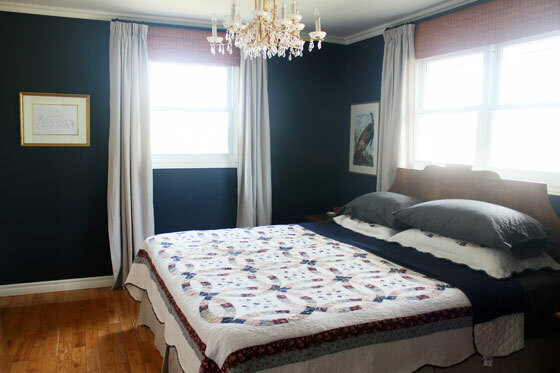 Have you ever made your own curtains? Any tips to share from your experience? That pinch pleat tape is genius! I am going to look for some of that. I never knew it existed. I have done this, including the tape. 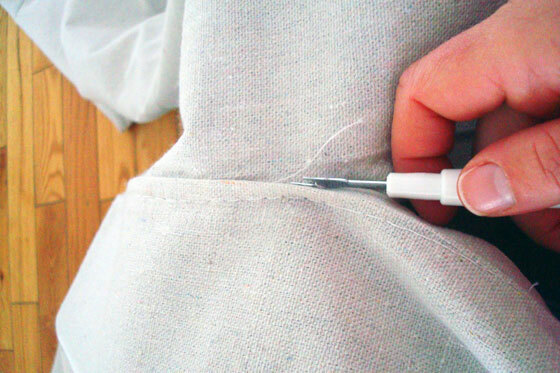 What I didn’t figure out, however, was how to fix that pesky hem problem. So thanks for that! Very clever and practical. The curtains look lovely, btw. It’s definitely not scientific, but it works! Oh my, so smart! I didn’t know about this tape, but it doesn’t make the project any less genius or beautiful to me. Still very much admiring this lovely room! Thanks so much, Britt. 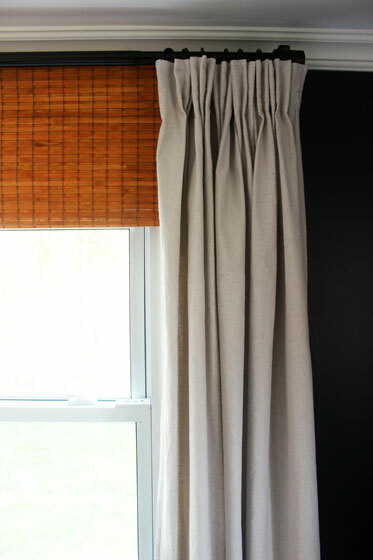 If you ever make curtains, I encourage you to give the pleat tape a try! My tip for making curtains is: measure, measure, measure. No matter how much I measure the ends never completely match up. So frustrating, I just leave them open! Lol. Very good tip. Although leaving them open is a perfectly acceptable solution!